Brain Stann (Pictured) was set to roll out the welcome wagon for Hector Lombard at “UFC on FOX 4” until a separated shoulder forced the middleweight on the IR. Over the weekend, Stann revealed his injury occurred when a teammate accidentally landed on him during a grappling session. 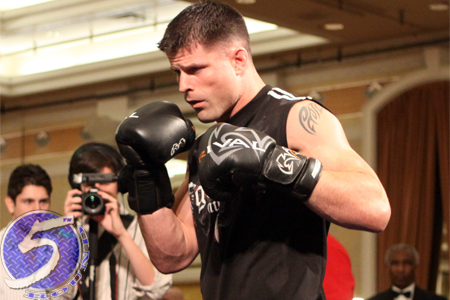 “It’s a grade-two separation of my right AC joint, which is what I am feeling right now,” Stann revealed to FUEL TV. “It’ll be six-to-eight weeks recovery, but no surgery, thankfully. Hopefully, I can heal this up real quick and get my full range of motion back. Right now I can’t even pick my hand up. Stann is the latest in a long line of UFC stars to get stung by the injury bug within the last month. Although the 31-year-old is staring a two-month setback dead in the eyes, “The All American” is hopeful to be back in action before then. However, he’s under doctor’s orders to take thing slow. “Probably the biggest issue I am going to face now is trying to return too early,” Stann admitted. “I would like to get back in the gym and try to hit some pads in 4-5 weeks, but the doctors were very adamant that even at six weeks I am not going to be able to put the pressure on the shoulder to wrestle the way I should. Stann has rattled off wins in four of his last five fights, with his most recent coming earlier this month in a vicious TKO over Alessio Sakara. MMA’s modern day G.I. Joe’s lone blemish during his present run came against current top contender Chael Sonnen.